One of the most long-lived and fiercest marine predator in history was the ichthyosaur, and a recent fossil find from China bridges an important gap in the creature’s evolutionary history. Ichthyosaurs were predatory marine reptiles that swam the world’s oceans while dinosaurs walked the land. They appeared in the Triassic period, dying out around 25 million years before the extinction event that wiped out the dinosaurs. much more streamlined, fish-like form built for speed. One species has been calculated to have a cruising speed of 36 km/h. These enormous predators remained at the top of the food chain until they were replaced by the plesiosaurs. 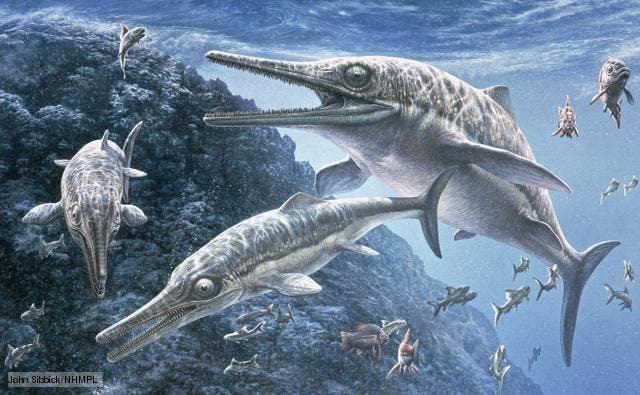 The ichthyosaur (Greek for “fish lizard”), which lived from about 248 million years ago to about 95 million years ago, has been liken by many with modern day dolphins since both exhibit streamline muscular body, dorsal fins specially evolved to cut through water, a propulsive tail and keen insight. The similarities end here, however. While dolphins are peaceful mammals, the ichthyosaur was a fierce marine predator which could grow to up to 20 meters in length and had sharp teeth in long jaws. The name fish lizard comes from its evolutionary lineage. Like many reptiles of their time, the ichthyosaur forefathers were land reptiles who made the return back to the sea, again just like the dolphin’s mammalian ancestors, which is why biologists like to give the two as perfect examples of convergent evolution. A side-proof is the fact that the ichthyosaur was an air breather. 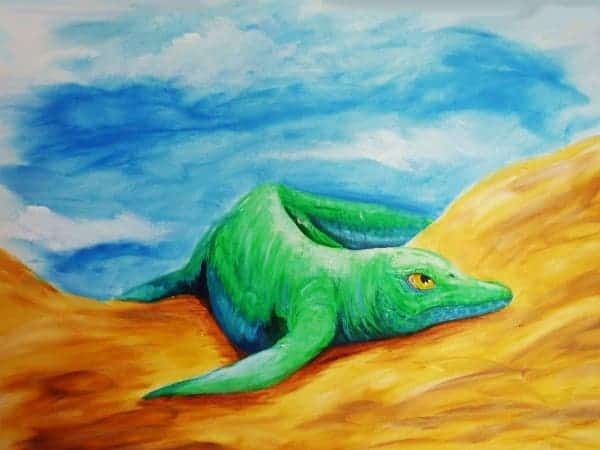 While the animal was perfectly adapted to a marine lifestyle, scientists have been looking for a missing link in fossil records that might help paint a clear picture of how the land to water transition took place. Now they have it. Meet Cartorhynchus lenticarpus, the smallest ichthyosaur to date. “[..]now we have this fossil showing the transition. There’s nothing that prevents it from coming onto land,” said Prof Motani, who is the first author of a paper published in the journal Nature. Luckily for paleontologists, a complete skeleton of C. lenticarpus. was discovered in China in 2011, where an adult specimen was unearthed from 248 million-year-old marine sediments. From the findings, researchers reckon that the ancient ichthyosaur must have measured only 40 cm in length and weighed only 2 kilograms. Most importantly, however, is that the animal had small and widely separated forelimbs, which means it had cartilage-filled flippers instead of legs. At the same time, it had thicker bones than previously described ichthyosaurs, which helped it swim through rough coastal waves before entering the deep sea – like a scuba diver’s weight bell. Image credit: Stefano Broccoli / University of Milan. 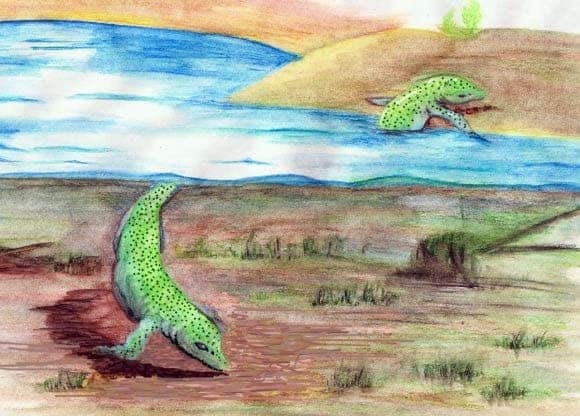 Thus, C. lenticarpus “is the closest thing we have to a terrestrial ancestor” of ichthyosaurs, says Valentin Fischer, a vertebrate paleontologist at the University of Liège in Belgium, who wasn’t connected to the research. The ancient ichthyosaur evolved only a couple millions years after the end-of-Permian mass extinctions, which wiped out as many as 90% of the species on land and 70% of those in the oceans. A growing debate is how long it took for life on Earth to recover from such a calamity, caused by a global warming event, and C. lenticarpus will help with setting this timeline. “This was analogous to what might happen if the world gets warmer and warmer. How long did it take before the globe was good enough for predators like this to reappear? In that world, many things became extinct, but it started something new,” Prof Motani said.